I got married in October 1996 and I made a speech. I had something to say. And I wanted to say it publicly. I began by stating that although I was clearly very happy to be now married to the very nice fella beside me, I was also feeling a bit disappointed with my new title of wife. Because being a wife meant that I was now respectable. I had returned to the warmth and security of ‘polite society’ from the draughty corridor where I had lived for the previous ten years. I felt a bit like a traitor and wondered how I might hold on to a little of my ‘disreputable’ status as I began married life. My eldest daughter was born in 1987. Three years after Anne Lovett died with her newborn infant in a freezing graveyard in Longford. The term ‘illegitimate’ was still very much used to describe children such as my daughter. I was a working woman of 25 but I was an ‘unmarried mother’. And while not as scandalous as it would have been decades earlier it was still a status that made the rest of society very nervous. I was reminded of my awkward wedding speech last week as I listened to Panti Bliss make her eloquent Noble Call on the Abbey stage. She spoke about the so called little things that felt oppressive. Things like listening to TV debates where nice people debate about her and what rights she should and should not be allowed. Things like reading newspaper columns written by a nice middle class woman arguing reasonably about how you should be treated less than everyone else. As I listened to her I remembered. I remember being asked, by people I knew, if I was collecting “the mickey money” for my trouble. They thought they were making a witty, light remark. It felt oppressive. I had ‘friends’ who stopped inviting me to dinner because I had wandered into some kind of no man’s land of being single but not being free. Or was it because they assumed I had some kind of less moral code than they did. Yes, Panti, it too felt oppressive. But as she continued her talk I realised that I was now that middle class woman in the coffee shop that Panti referenced. The one that Panti thought just may have agreed with the nice newspaper columnist who thought gays were less equal. Here I am buried in a nice suburb with my husband and my now respectable family. Panti said we are all homophobic and sure how could we not be having grown up in Ireland? Oh my God, I thought, have I forgotten what it felt like on the outside? And yes I had forgotten. I am now married almost twice as long as I was an ‘unmarried mother’. But what Panti articulated so gracefully brought back vivid memories. I also spent years listening to the reasonable middle class commentators debating about me and my likely impact on society. And the worst part is that after a few years I subconsciously started to believe some of what they said. Us ‘unmarried mothers’ of the 80s and 90s were told, time and time again, that we were likely to cause society to break down. We heard some of the very same rhetoric that is now being rehashed in the marriage equality debate. The main point which was always that children need a mother and father in order to grow up right! Our single parent households were bound to produce children who would grow up to be dysfunctional at best and most likely be delinquent. It was a huge relief and surprise to me when in a stunning moment of clarity at her 21st birthday I realised that I had done a good job and my daughter was OK. Just like thousands of other single parents in this country. 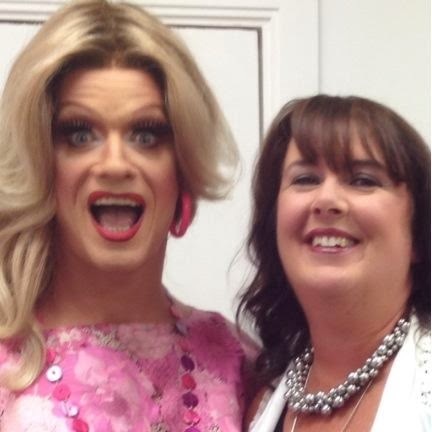 I have had the pleasure of meeting Panti Bliss last year, when we were both on a panel on TV3’s Midday programme. I had never met a drag queen before. Hell, I have never been to a gay bar and until very recently I had never had a gay friend, as far as I knew anyway. I had to check with the programme’s producer as to whether I refer to Panti as ‘her’ or ‘him’. I was so way out of my middle class suburban comfort zone. This week Panti’s Noble Call has made me take a long honest look into my soul. Am I homophobic? More importantly are my children growing up with homophobic attitudes that they are subconsciously picking up in my home. I certainly hope not. But it’s not enough to say yes to marriage equality because in my view, that’s easy. And it’s straightforward. Equality can’t come with conditions or limitations. But are we sure we are all sitting comfortably with what Panti refers to as “gender discombobulation”? That, that Bard might have said, is the question. Hi Barbara 'mickey money' for feck's sake – that is terrible that people said that to you and what you had to go through to be a fantastic mum. I really appreciate how you've never forgotten and always stick up for us lone mammies – on twitter anyway I've seen you do it loads of time 🙂 That is such a good point you're making that the right-wing Catholic constituency have always thought the sky would fall in if babies were brought up by anyone who wasn't catholic, middle-class and married and this thinking lead to heinous abuses from people who shared their philosophy – I hope they are reminded of the chicken licken nature of their argument frequently. Olga – I don't think there should be a 'reasoned debate' about your rights either, feck right off indeed. Which is the argument used when inter-racial marriage was illegal. Yet those same people would never claim today that a single parent was unfit to raise a child. People are scared of change, and scared of things they don't understand. I can appreciate this. But a simple look back at history will show how unfounded these fears are, and it's difficult to see anyone who stubbornly hangs on to these arguments as anything but a bigot. Great post. Here's to progress—just treating people like people—in all circles of society! Heterosexual marriages are not exactly the pinnacle of perfection. Close to 50% of them end in divorce/separation. Many others are downright unhappy marriages where communication breaks down. So why this 'institution' of married bliss needs to be protected or elevated is baffling really. Great analogy Barbara, enjoyed that piece. S.
I still get the 'mickey money' comments. One friend up until a few years ago thought all single mothers received single parents' allowance regardless of whether they worked or not. I've been accused of doing it on purpose because women today 'don't get pregnant unless they want to'. I thank god that I wasn't a single mother in the 80s and 90s or earlier, but I sometimes do feel oppressed, unfortunately. Great article by the way. Its sad that we all know what was meant but the media carry on with this charade of what does homophobia mean. There's such a gap between what people think & what the media reports. In reply to anonymous above: unfortunately what does homophobia mean is at the heart of the issue, especially when someone claims to have been defamed. Anyway, as I have written on my blog, we can get around the whole problem of the word homophobia by using a new word: 'gayist'.